I’ve made pop tarts a few times in the past. They’re definitely a labour of love and a bit fiddly, but completely worth it. I like to make the compote or jam filling quite tart to balance out the sweet icing. First make the pastry. Sift flour and 3 tbsp. icing sugar together (I don’t usually sift flour because I’m lazy, but the icing sugar is lumpy so I sifted everything). While you’re at it, sift a further cup of icing sugar and set aside for the glaze. Tip the dough out onto a floured surface and gently knead until it forms a nice smooth ball. Try not to over knead it. Wrap it in cling film and put it in the fridge for an hour to rest. Next, use the flat of a knife to squash the cardamom pods and take the seeds out. Crush the seeds in a mortar and pestle until they are a fine powder. Set aside. To make the rhubarb compote for the middle of the pop tart, preheat the oven to 160 Celsius and cut the rhubarb into smallish size pieces. Line a baking tray with baking paper and spread the rhubarb out. Sprinkle over the raw caster sugar and half of the cardamom and mix through. Cook for about 30 minutes until the rhubarb is very soft and falling apart. 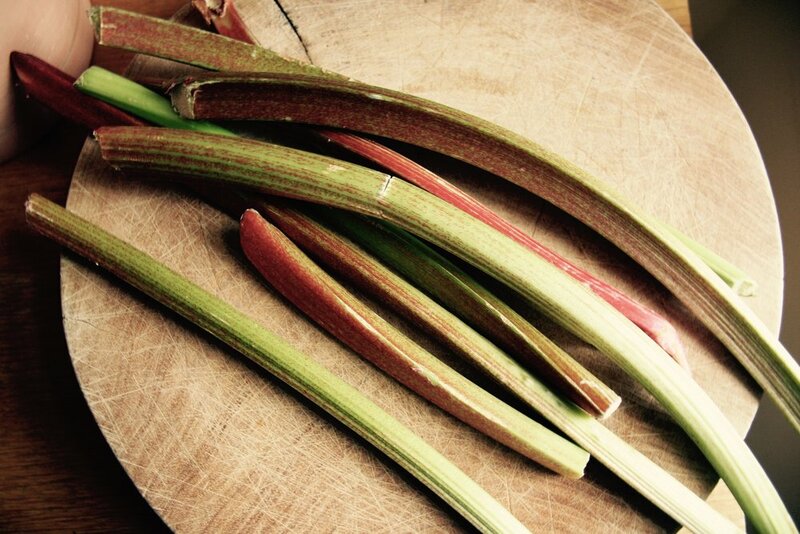 When it’s done, taste the rhubarb and make sure it’s tart/sweet enough for you. If it’s too tart, add more sugar to the tray and pop it back in the oven for another 5 minutes. When the rhubarb is squishy and tastes good either blitz it with a stick blender or with a fork until it is a thick jam/paste. Set aside to cool. Next, line 2 baking trays with baking paper. 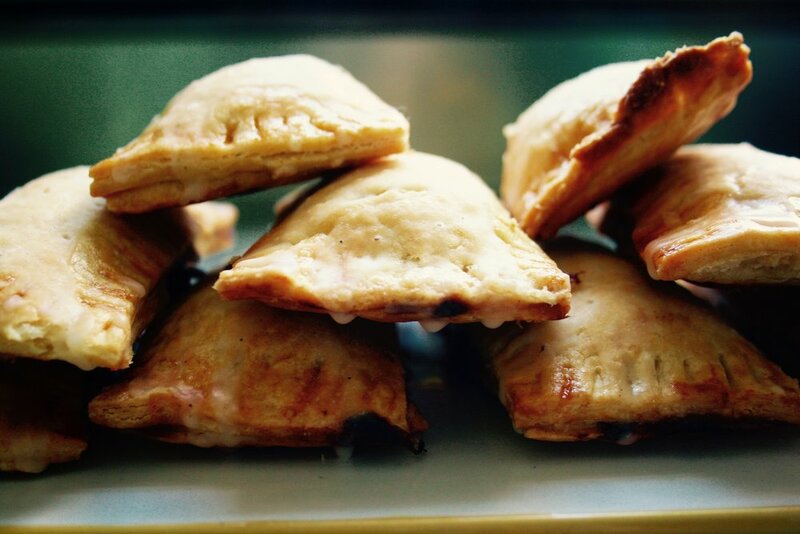 Take the pastry out of the fridge and cut in half. Leave one half in the fridge while you roll out the other. Roll the pastry out, on a floured surface, into a rectangle shape, roughly 35cm x 65cm. You need to cut 10 rectangles approximately 7cm by 13cm each. As you cut each rectangle place it on one of the baking sheets and once all 10 are done, pop them back in the fridge while you roll out the second half. These will be the bottoms of your pop tarts. Repeat the process, re-rolling the off cuts if you need to make up the 20 rectangles in total. Once you have your rhubarb compote cooled and your pasty rectangles cut, you’re ready to assemble. Beat one egg in a small bowl with 2 tbsp. of cold water to make an egg wash. Using a pastry brush, brush one tray of pastry rectangles with egg wash – brush the entire rectangle generously. Working quickly, place a spoonful of rhubarb compote in the middle of each tart and spread around, leaving a border to crimp the edges. Try to fill it as much as you can so you get a good ratio of fruit to pastry. (I’d rather have a bit of a messy-jam-bursting-out-of-pastry-incident than dry pastry with not much in it). Once the bottoms are ‘jammed’ brush the other tray – the tops of the pop tarts - with egg wash and place on the jammed bottoms, egg side down. Push the edge of each tart down firmly with your thumbs and then crimp the edges with a fork. Prick the top of each pop tart 4-5 times with a fork too. Then finally egg wash the finished tarts. Cover the tray with cling film and pop in the fridge for 20-30 minutes. It will stop the pastry from shrinking up while it cooks. Meanwhile pre heat the oven to 180 Celsius. Bake the tarts for 30-40 minutes until they are a deep golden colour. Let them cool on a wire rack. To make the glaze, add 2 tbsp. of milk and the rest of the cardamom to the cup of sifted icing sugar and stir to combine. 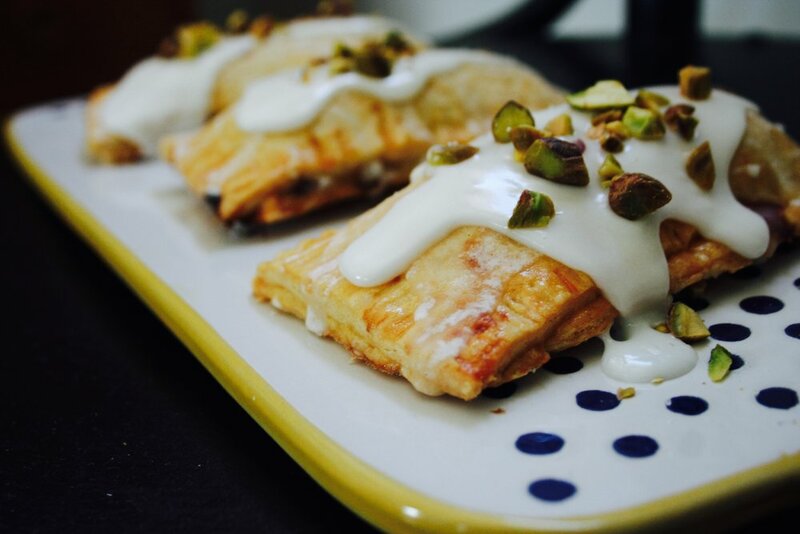 Pour a spoon of glaze over each pop tart and sprinkle pistachios on top (if you’re using). 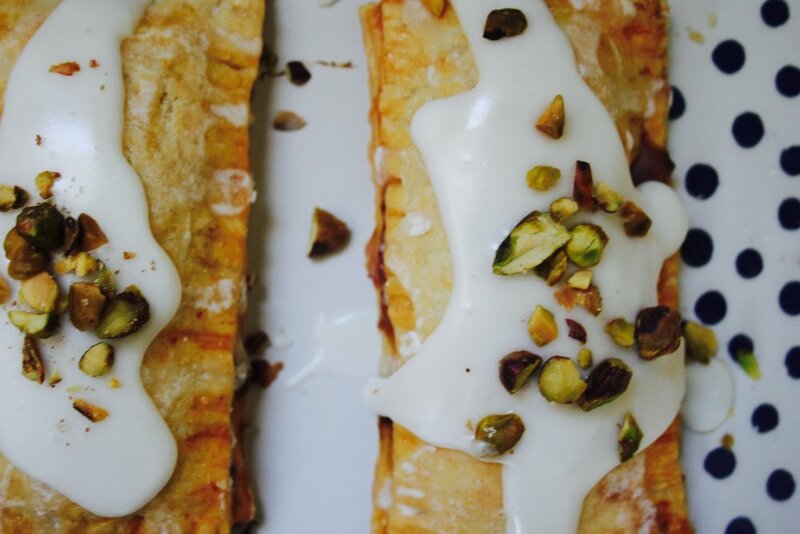 If you’re going to eat them straight away then glaze the pop tarts and eat while they’re still warm. Otherwise, if you have one of those cool large toasters then toast them, or grill the pop tarts quickly to warm them and serve with ice cream.